About Us - Twin Oaks Refrigeration, Heating and Cooling, Inc. Defines Twin Oaks Refrigeration, Heating and Cooling, Inc. Thank you for the opportunity to let us familiarize you with Twin Oaks. Twin Oaks has many years of experience with installing and providing service for commercial and residential projects, in southeastern Ohio and West Virginia. 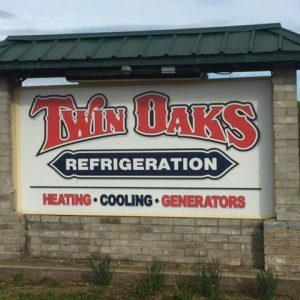 Our company’s dedication to outstanding performance, with high levels of professionalism has enabled Twin Oaks to become the most respected HVAC, Refrigeration and Generator company in the region. We value and appreciate, the trust placed in us by our clients! Whether your project is elementary or multifaceted, we are committed to “getting the job done.” The trust placed in our staff does not stop at the completion of the work. Dedication to our customers continues far beyond installation. Twin Oaks provides it’s customers with a service staff they can depend on. Our goal is not just to meet the expectations of our customers; it is to exceed those expectations. The purpose of Twin Oaks is to build long lasting relationships with our customers who place their faith in us. Our President Ed Castle specializes in quality craftsmanship, from installation to servicing. Ed’s quality craftsmanship is backed by almost 30 years of experience. Quality Customer Care is what we are all about! As you search for a reputable company, that has highly regarded leadership traits in the industry, with expertise in installation or service we want you to consider Twin Oaks for your needs. Contact Us, so that we may speak to you on the wide range of products and services we offer. Thank you, in advance, for considering Twin Oaks. We look forward to hearing from you. We offer the best systems backed by the best warranties! "Your repairman performed in a responsible manner that I would not hesitate to call for your services again. Thanks also for your quick response to my needs."